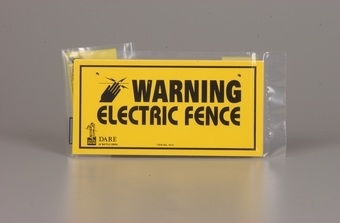 The words 'WARNING ELECTRIC FENCE' Printed on both sides. 4 inch x 8 inch with bold black letters on bright yellow laminated vinyl. 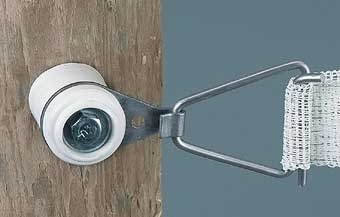 Two holes to nail on post or hang from wire. 3 each per package. Fits all steel T-posts, 1.01, 1.25 and 1.33 lb/ft. and can be nailed on top of wood post. For all Wire, Polywire, Polyrope, and tape up to 1 1/2 inch. 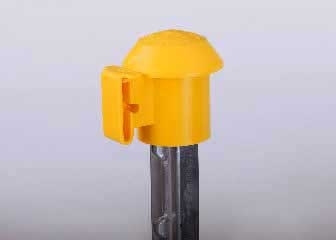 Protects horses and other valuable livestock from sharp, jagged T post tops. 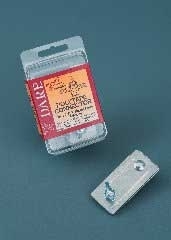 Large heavy-duty cap/insulator can be installed with wire holders facing front, back, right or left. Strainer handle. 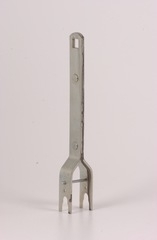 Designed to tighten strainer Dare No.1703 with prong end of handle and Dare No.1703C with the square cut-out end of handle. Tension measuring scale on handle. Heavy riveted construction. Zinc plated. 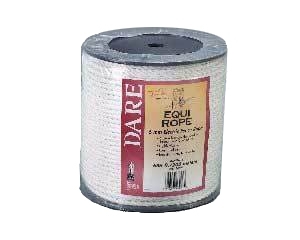 6MM Poly Equi-rope X 600 ft. Braided HD polyethylene rope with 7 strands of stainless steel wire. 15/64 in. approximate diameter. 628 lbs. average breaking strength. 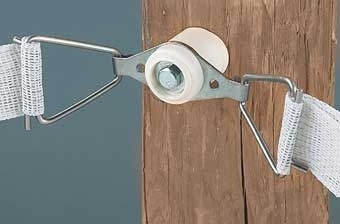 End Tensioner for polytape up to 1 1/2 in. wide. Allows easy retightening. Grips tape tightly to prevent whipping and sawing. Lag bolt included. For tape up to 1 inches. Use to connect fence charger to tape or as an end clamp. May also be used to fasten inch tape to a gate handle. 2 per package. 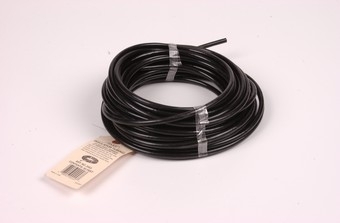 Black polyethylene tubing accommodates up to 12 gauge fence wire. Use under driveways or gates to insulate one wire from another. Withstands 20,000 volts. 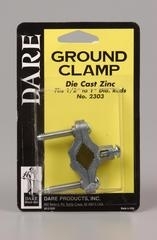 Die cast zinc ground clamp. Fits 1/2 in. - 1 in. diameter ground rod. Used to connect ground wire to the ground rod. Individually blister packed. For high tensile or regular electric fence. Use to Connect 12 gauge - 14 gauge fence wire to 12 gauge - 14 gauge hookup wire. 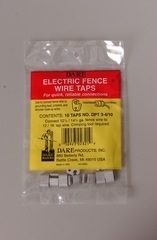 The taps are handy when used to connect hook-up, grounding and jumper wires to the fence line. Trouble-free connections can be made quickly and easily. Not a splice. 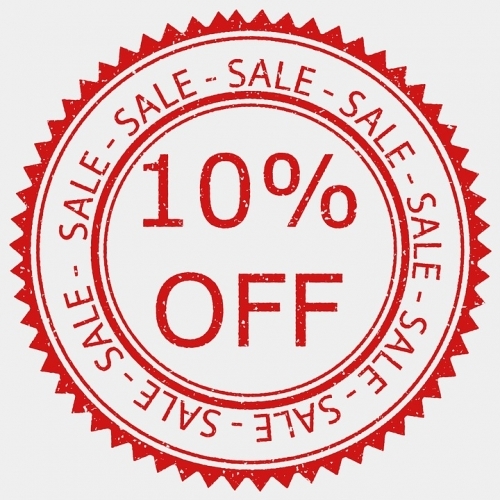 10 per package. For polytape up to 1 inches wide. Assembled with two triangle grips so that you are able to use in two separate directions. Fits 1.225 and 1.33 T-posts. 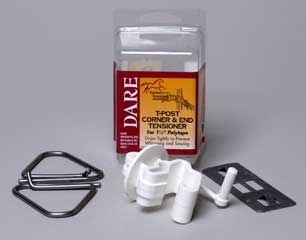 Corner Tensioner for poly tape up to 1 1/2 in. wide. Use at all corners. Assembled with two triangle grips so that you are able to use in two separate directions. 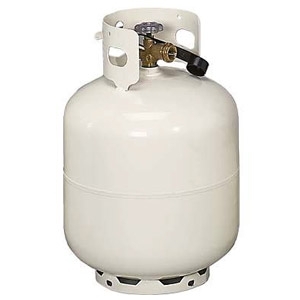 Also use as end connector and gate anchor combination. Suitable as a corner and end.